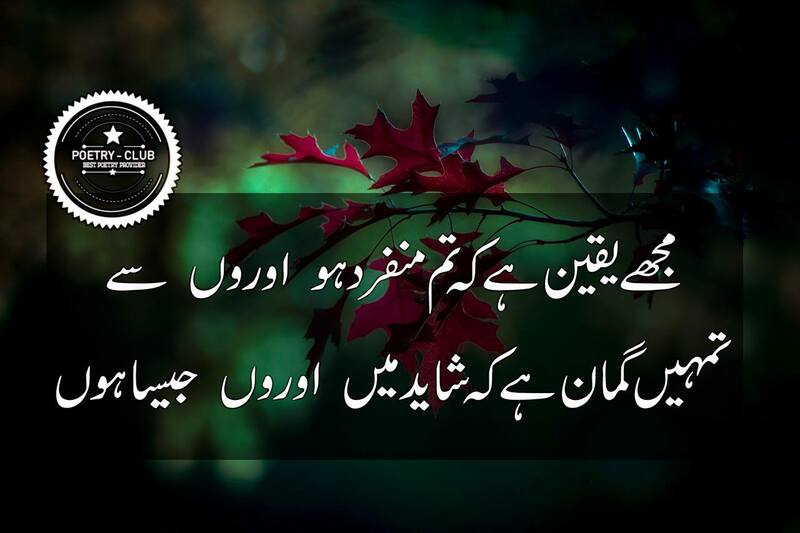 POETRY CLUB 2 Lines Poetry Image Poetry Sad Poetry Urdu Poetry Muje Yaqeen Hy Ky Tum Munfrid Ho "Oroon" Se ...! Muje Yaqeen Hy Ky Tum Munfrid Ho "Oroon" Se ...! Tumhy Ghumaan Hy Ky Shayed Mein "Oroon" Jesa Hun ...! Poetry Club is an online platform where you will find all types of Poetry including Image Poetry and Texture (Urdu and Roman) Poetry. Here you will find tons of poetry. Not only Poetry you will also find all type of Quotes including Inspirational Quotes, Love Quotes, Happy New Year, Wedding Quotes etc in English and Urdu languages.